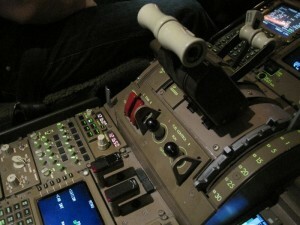 Well, in a simulator, but still… 🙂 The next action item after being to the Engineering base was the 777-sim ride. Air NZ has two simulator and training buildings in the vicinity of Auckland Airport. The one that hosts the 777-200 simulator also houses a Q300 simulator (if I remember correctly), used by the regional subsidies of Air NZ, and a shiny new 777-300 simulator. The first actual deliveries of the 777-300 order are scheduled to arrive in November 2010. There’s also a 787 simulator been ordered, but given that the plane itself is currently going through the certification process and modifications might be made, I doubt that’s due any time soon. The picture below gives you a rough idea what those simulators look like (note: this is not any of the actual Air NZ sims). The autostart feature of the 777 is pretty cool. What it comes roughly down to – make sure breaks are set, engine is in autostart mode and provide fuel to the engine and off you go. Same for shutting it down (and that’s very similar to the type of planes I fly) – cut the fuel flow into the engine and it will shutdown. The next image shows the controls below the FMC – the big lever is thrust and to the right you can see the settings for flaps – from 1 to 30 degrees. 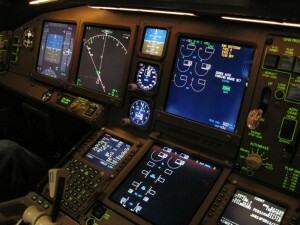 When the simulation launched we found ourselves at gate 3 of NZAA international, scheduled to take-off from Runway 23L. First interesting challenge (after starting the engines and being pushed back) – finding the correct taxiways, keep the plane on the yellow line to avoid hitting any building, car or other plane along the way and line up correctly. It was quite amazing how real those simulators feel. It takes quite a while for the 777 to overcome the intertia but after I got it rolling once, it hardly wanted to stop. Lined up correctly, the takeoff was initiated, auto-thrust took over and soon after we reached the rotation speed of (I think) some 150 knots and off we went. We took off from 23L climbed out quite straight ahead for a short moment and then banked into a right turn for a Peeha One Alfa departure from NZAA. 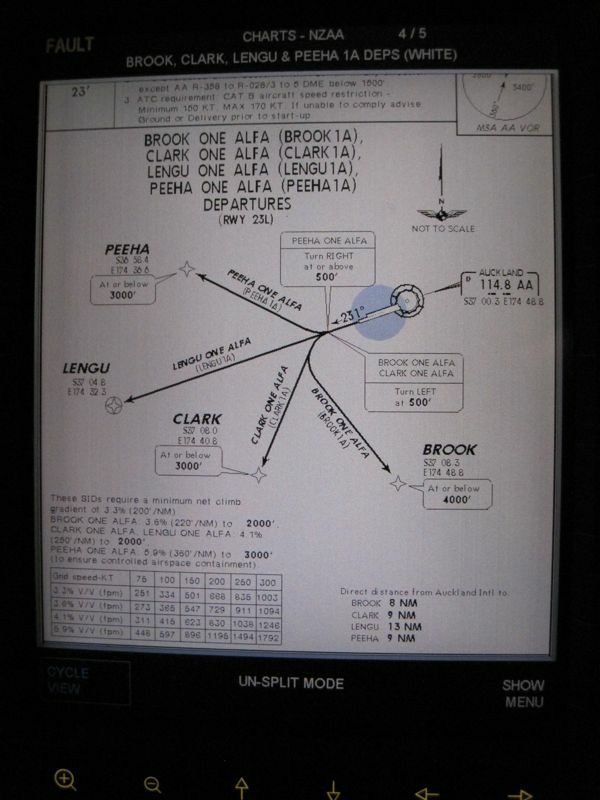 I found the flight director instrument helping a lot with that – awesome little thing I’d love to have in my 172 🙂 Below is the ILS departure chart, having reached 3000 feet, Auckland city was already clearly coming in sight and we did a few turns and basic maneuverers to get grip of the plane. 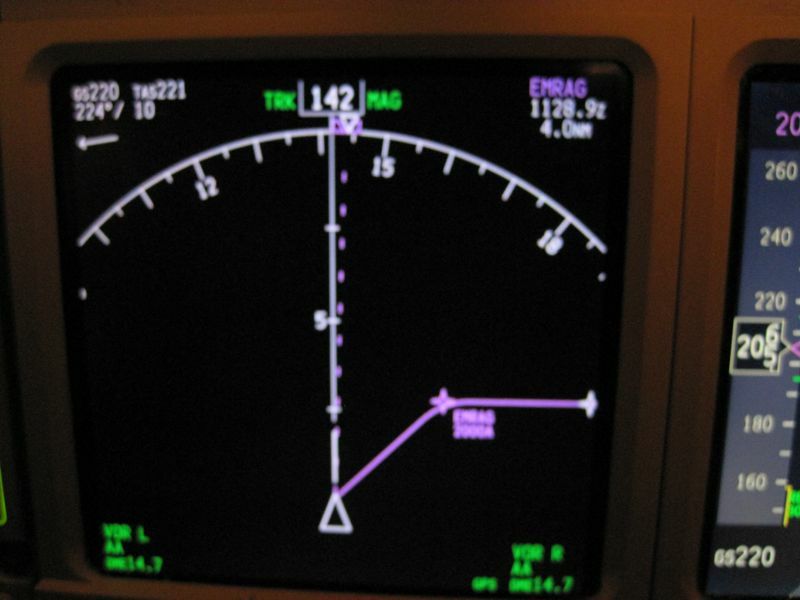 We then programmed an ILS approach for runway 23L via the navigation point EMRAG into the flight computer and the navigation display started to show me the approach pattern (basically an arc that leads into finals for 23L) to follow. The idea of such a pattern is that the pilots ends up being on a 3-dimensional glide slope that leads directly to the touchdown point. 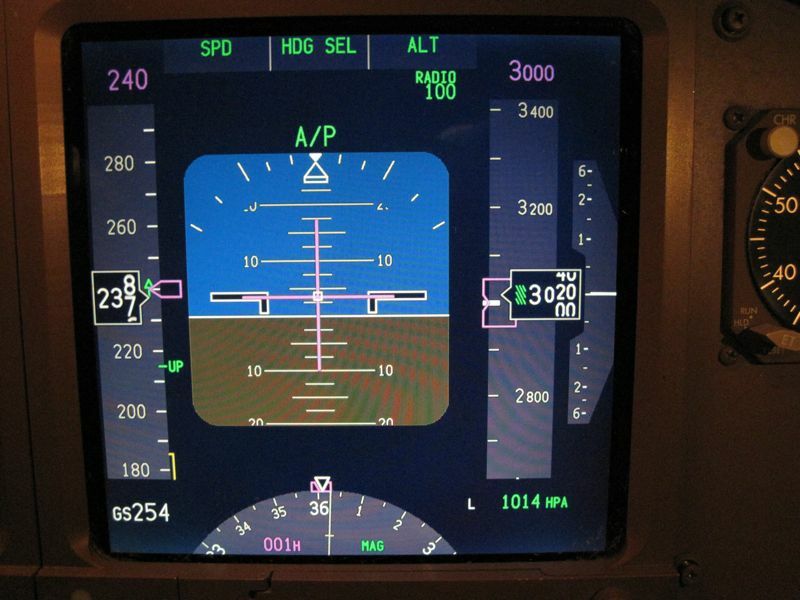 You’re given vertical and horizontal indicators in the Flight Director screen, which is very helpful. 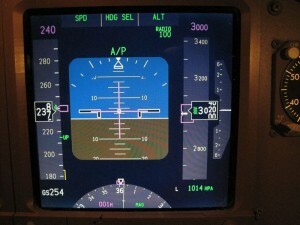 When we entered the approach, we disconnected the autopilot and I flew the plane through the arc and on finals. My first approach became slightly wobbly at about 1000 feet – not badly though, but I had issues keeping the wings perfectly level because I lost the glide slope a few times and tried to catch up with it. When you approach the ground, the plane will very clearly call out the altitude (as in “one hundred!!!!! … fifty!!!! … thirty!!!! etc) so that the pilot is def. aware of the fact that a landing is to be expected very soon. As a consequence of my wobbly approach my first touchdown was a bit too hard, but still came in reasonably straight on the centreline and when the thrust reversers and auto-break kicked in we got to a quite quick stop. Joy then asked me if I wanted to do another one (WHAT A QUESTION!) – sure I wanted. Actually it ended up being two more and my second and third approach were so much nicer and smother and particularly in the third I got the hang of it. 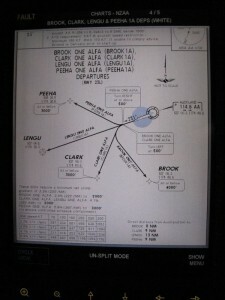 The picture below is a (slighty blurry) shot of the navigation display and you can see that the turn is not a perfect arc. That’s because we started that particular approach closer to EMRAG and then it became some sort of a short-cut approach into 23L.